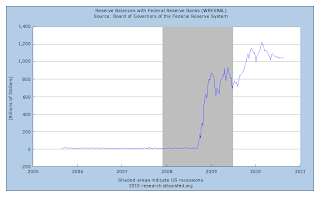 Stephen Williamson: New Monetarist Economics: The Fed's Balance Sheet, Deflation, Etc. I've been puzzling over two key current policy questions: (i) Does a change in the maturity structure of the assets held by the Fed matter? 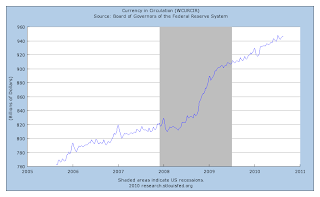 (ii) Is sustained deflation possible in the United States in the near future? In answer to the first question, I'm beginning to think that the answer is yes, and I'll explain why. For the second question, I've explained before (here and here) why I think the answer is no. I'll expand and modify that view here. Let's start with the current composition of the Fed's balance sheet, posted here. On the asset side, of a total of $2.3 trillion, $780 billion are US Treasuries, $157 Billion are agency securities (Fannie Mae and Freddie Mac obligations), $1.113 trillion are mortgage-backed securities (MBS, backed by conforming loans), and the remaining $250 billion is what remains of the emergency credit programs instituted after the Lehman Brothers failure plus assets acquired from Bear Stearns and AIG. These asset holdings are financed, on the liabilities side, by $947 billion in currency outstanding, $1.039 in reserve balances, with the largest component of the remainder (something more than $300 billion) being primarily deposits of the US Treasury with the Fed. If we compare the current Fed balance sheet to what it was on January 2, 2008, what's the difference? First, in this table, note that the total quantity of Treasury securities held relative to August 10 of this year is only about 5% smaller. The composition of Treasury securities is quite different though. At the beginning of January 2008, about 30% of Treasuries held were T-bills, but these holdings are now mainly long-maturity nominal T-bonds. On the liabilities side, in the following two charts I show total currency outstanding and reserve balances. As we all know, pre-crisis the Fed financed most of its portfolio with currency outstanding; currently more than half of the Fed's liabilities are reserves. 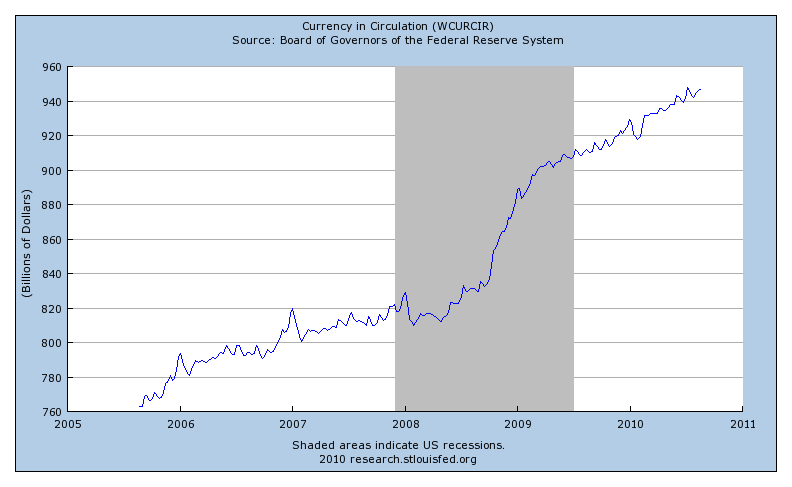 Further, currency has recently been growing at a steady pace of about 4%, year-over-year. 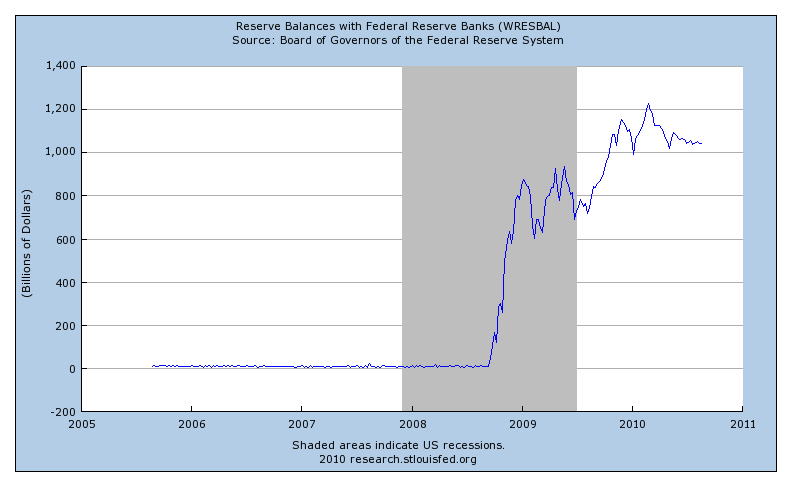 We shouldn't forget the Treasury's deposits with the Fed, which are signficantly larger than was the case pre-crisis. These deposits, about $200 billion in a "supplemental financing account" we could think of as a convenient accounting gimic which allows the Treasury to intervene in the mortgage market without having this show up on the Treasury's books in an obvious way. Now, part of the Fed's "quantitative easing" program has been the dramatic shift towards long-maturity assets. One can certainly question the wisdom of private asset purchases (MBS) by the central bank, but let's focus on the Treasury holdings. Clearly policymakers in the Fed (e.g. Jim Bullard) and some empirical work in the Fed system (e.g. Chris Neely's work) support the view that purchases of long-maturity assets by the Fed matter. Why would it make any difference if the Fed swapped T-bills for long-maturity Treasuries? Certainly, in a complete-markets world, this cannot matter - indeed in such a world we would not need the Fed, currency, or banks, so we obviously need to depart from that paradigm. However, one can still derive irrelevance results for monetary policy in models with frictions, for example see this paper by Neil Wallace. However, suppose that we think about the "liquidity yield" on assets, i.e. their value in transactions. Clearly, T-bills have a high liquidity yield - they are used as collateral in a wide array of financial transactions, for example, and are traded frequently. T-bonds have a low liquidity yield. Now, what happens if the Fed swaps T-bills for T-bonds? T-bills are now less scarce relative to the transactions in which they are useful, so we might expect their prices to fall. However, under current circumstances where, with a positive stock of excess reserves, short-term interest rates are essentially determined by the interest rate on reserves, we would not expect anything to happen at the short end of the yield curve. What about the long end? With a larger supply of liquid assets on hand, maybe long-maturity bondholders demand a lower premium to hold long Treasuries, and their yields fall. This is actually fairly straightforward. It's no more sophisticated than the reasoning that tells us that a standard open market purchase matters - we are trading a highly-liquid asset for a less-liquid one. To the extent that any theory is brought to bear on why the Fed could currently reduce long bond rates through intervention, people have appealed to vague "preferred habitat" stories. I prefer my story, but of course I have no empirical evidence, and only a vague idea what the model would look like that would deliver this result. Now, was what the Fed did a good idea? We could argue yes at least for the early stages of the crisis. The MBS that, pre-crisis, were used widely as liquidity in financial markets, essentially went away and had to be replaced by T-bills. It made sense for the Fed to, at least temporarily, restructure its portfolio toward long-maturity assets. One could argue that this replaced public liquidity with private liquidity, and was efficient. Would be a good idea to keep this maturity structure in place or for the Fed to buy more long-term Treasuries. That's more questionable. Maybe the need for this is long past. I argued here that we should not be worried about deflation. In part, this was a backward-looking argument, based on the behavior of the stock of currency, along with observations about the implied inflation premium on long-term Treasuries. Now, if you have been watching bond yields recently, you will have observed two things: (i) The yields on both nominal Treasuries, and inflation-indexed Treasuries (TIPS) have both fallen; (ii) The difference in those yields (a measure of the inflation premium on long Treasuries) has also fallen. This may reflect the view of the market that, given the last Fed statement, and public statements by Jim Bullard, among others, the Fed knows something the market cannot see directly, which is that inflation is going to be much lower for an extended period, if not negative. In this case, I agree with Kocherlakota, that the market has it wrong. As Kocherlakota argued, most of our monetary models tell us that, if the Fed maintains a constant nominal interest rate target forever, that will essentially determine the inflation rate, by way of the Fisher relation. If the Fed keeps the short-term overnight rate at 0.25% forever, and if the long-run real interest rate is 2%, the inflation rate must be -1.75%, which would be supported (roughly) by long-run growth in some monetary quantity of -1.75% plus the long-run growth rate in real GDP. This makes deflation seem like a real possibility if the Fed maintains a target nominal interest rate of 0.25% for an "extended period," as specified in the FOMC statements since all the trouble started. However, consider this. Suppose, as seems to be implied by the last FOMC statement, that the Fed intends to hold the size of the balance sheet constant, in nominal terms, for the immediate future. Suppose that what they mean by this is that the balance sheet will remain constant until the stock of excess reserves "runs off," at which time we will go back to a "normal" policy regime. By normal policy, I mean an implicit inflation target of 2% supported by a nominal fed funds target, recalibrated at each FOMC meeting. Now, what happens between now and the time at which excess reserves go to zero? Suppose over that period that the interest rate on reserves (the relevant policy rate when excess reserves are positive) stays at 0.25%. Suppose that the inflation rate over that period is 2% and that real GDP grows at 3%. Also suppose that the quantity of currency relative to nominal GDP is constant, implying that the stock of currency outstanding is growing at 5% per year. At this rate, excess reserves will run off in about 18 years. By that time, the majority of the MBS on the Fed's balance sheet will have disappeared, and the Fed will be back to having mainly Treasuries in its portfolio. Could this be an equilibrium path for the economy? Well, given what I specified here, it seems unlikely that banks will wish to hold excess reserves for 18 years given a real return of -1.75%. Somewhere in that 18-year period, the Fed will have to raise the interest rate on reserves, otherwise the stock of currency will be growing in excess of 5% per year, and the inflation rate will rise above 2%. Thus, if anything, the inflation risk appears to be on the up side, given stated policy. I don't see the deflation risk. "By normal policy, I mean an implicit inflation target of 2%"
But how sure are you that a majority, or a "consensus" (and I'm worried that Bernanke cares more about keeping a dozen people at the Fed relatively happy with "consensus" than doing great harm to tens of millions of Americans) still wants inflation of 2%, and not something extreme like zero inflation, or less as long as the Fed is not tampering with the perfect efficiency of the pure free market? Sounds like you have been brainwashed by PK. I don't think any of the people I know sitting on the FOMC think of the world as "perfectly efficient" or that they want to "do great harm to tens of millions of Americans." That's nonsense. FYI: The Bank of Canada's balance sheet has returned to normal. I deliberately stayed away from Japan talk. I think it's irrelevant. Yes, there are many things that are right with Canada - monetary and fiscal. 1. What makes you believe that banks' liquidity management is very interest rate sensitive? Liquidity risk seems to be a much more important variable, and when that declines I expect banks to drastically reduce their excess reserves (purchasing securities, making loans to prime brokerage clients, and actually making loans). 2. Currently the marginal value of reserves is pretty low for banks, but this doesn't mean that the Fed can remove huge amounts of excess reserves without pushing up the effective Fed funds rate (potentially until it hits it upper boundary at the discount rate). The Fed is forced to move gently. 1. If by liquidity risk you mean that banks are willing to hold reserves with a very low rate of return as insurance, possibly against the event that high-yield opportunities appear in the near future then, yes, I agree. 2. As long as banks are holding a positive quantity of excess reserves, the fed funds rate should be at its lower bound, which is the interest rate on reserves. However, yesterday the fed funds rate was 0.19%, and the interest rate on reserves 0.25%. Why? Fannie Mae and Freddie Mac do not receive interest on reserves, and apparently arbitrage is not perfect. If the Fed takes out excess reserves through open market operations, it won't move the fed funds rate from 0.19%, until excess reserves go to zero. 1. By liquidity risk I mean a bank's concern about it being able to withstand a slowdown or complete freeze in the money markets (Fed funds, repo, commercial paper, etc). So, yes, insurance...for now. When banks believe that the crisis has passed (low liquidity risk world), banks will want to put their excess reserves to work, disregardless (almost)of the level of the interest rate on reserves, which probably can't be much above the actual yield on T-bills. 2. With elevated liquidity risk, I would think that the funds rate would begin to move up long before excess reserves are depleted, should the Fed aggressively attempt to remove excess reserves. 3. Something we didn't talk about: large firms can operate independently of the banking system by issuing bonds or stocks. They will likely begin to invest and engage in M&A activity long before the Fed even begins to contemplate withdrawing reserves from the banking system. 4. Also, we are not Japan. Speed and aggressiveness of policy, population growth, and demographic composition are very different in the US today and expected future, relative to Japan during the last two decades. In short, I don't see how double digit inflation wouldn't become a problem?